I drew a line in the sand. “Enough is enough. Today, you have to choose between me and him.” And so at the ripe old age of fifteen I already felt I was entitled to the exclusive affection of the girl I was “in love” with. I would not tolerate any competition. Forced to choose, she did. Unfortunately, she did not have enough sense to choose me. She chose George! I went home and went to bed, a rejected boy. So if you think I am messed up today and in need of serious counseling, that’s why. Blame this girl who did not have enough sense to know what was good for her! But thank God, one person’s trash is someone else’s treasure. While others may reject you, God does not. When He had to decide what to do with you, He chose you. And just look at these powerful words penned by the Apostle Paul in Ephesians 1:3-5. Now, those verses actually say that God chose you before He started to create the world! That suggests He created the world for you, and He created it with you on His mind! Wow, I am God’s true love! Chosen, loved, accepted in Christ Jesus– if that can’t undo the damage done to my self-image by that girl who had no sense but to choose George over me, nothing else can! Beloved, you can’t make everybody accept you, or love you. It would be nice were that the case, but it just isn’t going to happen. 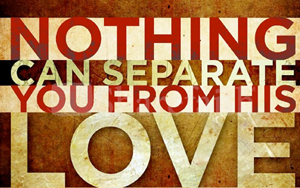 But should that really be a big deal since according to the Scriptures, you are God’s true love? So go ahead and do it! You have a right to feel very special. After all, the King of kings has chosen you for Himself. I was just searching for this info for some time. After 6 hours of continuous Googleing, at last I got it in your site. I wonder what is the lack of Google strategy that don’t rank this type of informative websites in top of the list. Usually the top websites are full of garbage. Glad you were blessed. Please direct others to this site. Thank you Bishop for always revealing deep wisdom to us, so powerful, especially in paragraphs 6,7. God never “PREPARE US BEFORE PREPARING FOR US”, like he did the world before us, check that out Brethren! I used to think that God created me to serve Him. now I know, God created me to be loved by Him. what Joy must it be for God to be serve by His sons whom He loved and not the servants whom He pays. may we see more of Jesus, God’s love personified. Thanks Bishop! So glad he chose me. Behold, what manner of love the Father has bestowed on me that “I” … yes, even “I” should be called a son of God. I am still amazed! Thank you! This is timely. Prompts the uplifting of my spirit in the face of challenges.